On the vigil of the Feast of the Sacred Heart in 2009, I am happy to present the poem "To the Sacred Heart of Jesus." Therese wrote this poem either in June 1895 or in October 1895 at the request of her sister, Marie of the Sacred Heart. She does not understand the Heart of Jesus as demanding reparation, but as "burning with tenderness." In her daring climax, she chooses that Heart for her purgatory. Searching for her Jesus, stooped down in tears. But nothing could calm her grief. Whom this fervent soul came searching for. To take him in her arms, to carry him far away. She had come well before dawn. Her God also came, veiling his light. Mary could not vanquish him in love! Jesus gave her back her peace, her happinesss. I wanted to see you and come close to you. The starry azure, the flower, and the bird. Who could always love me and never die. And becomes my brother and is able to suffer! You heard me, only Friend whom I love. To ravish my heart, you became man. And you still live for me on the Altar. I can rest on your Sacred Heart! You Yourself are my happiness, my only hope. Stay near me till the last night. And all my desires are well known to you. That I want to lose myself, O Heart of Jesus! Is worthless in your sight. I want to cast them into your Divine Heart. You did not find your angels without blemish. I hide myself in your Sacred Heart, Jesus. I know we have to pass through fire. Choose your burning love, O heart of my God! Enter straightaway into your Heart. The Poetry of Saint Therese of Lisieux, tr. Donald Kinney, O.C.D. Washington, D.C.: ICS Publications, 1996, pp. 117-120. All rights reserved. Used with permission. To read this and all of Therese's 54 poems, please order a copy of the book "The Poetry of Saint Therese" by clicking on the icon below. 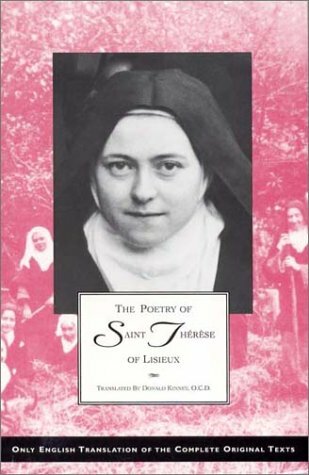 This edition is the only English translation from the critical and complete edition of Therese's manuscripts of her poetry. Even if you have read some other translation, I urge you to read this one, which includes the original French text and English notes rich in interest.